THE Virgin de Fatima prison in the suburb of Chorrillos in Lima is just a stone’s throw from the beaches of the Pacific Ocean. When I went there to try to visit Michaella McCollum, there was some confusion and I think the warden ended up thinking I was a relation. Whatever, it got me in the gate. I was stamped numerous times, searched meticulously, made remove my leggings, shades and had a bottle of Coca-Cola taken off me before I was brought into a small courtyard, which had a kiosk, some public phones and a few tables and chairs. I was carrying two yellow plastic bags containing sweets, chocolate and drinks. Very soon, two girls came walking towards me. 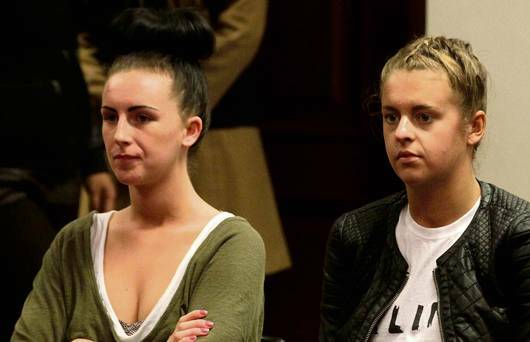 I had only asked to see Michaella, but when she came out, she was accompanied by her fellow drug mule, Melissa Reid. They looked somewhat perplexed, but smiling gracefully nonetheless. Of course I had read some of the nasty stuff on Facebook, so it was nice to discover that they were not a couple of hard cases. I found the girls to be very friendly and grounded, who used bad language less than I did. They find the media attention bizarre. When I spoke to them they were facing anything up to 15 years in prison, but in the end got six years and eight months. It was natural that there would be so much interest in the fate of these two pretty young women, though it may wane some, now that their fate has been decided. I explained I was an Irish photographer working in South America and that I also did some writing. Sadly I was not allowed to bring a camera into the prison. “I did photography too,” said Michaella. She said she wished she had a camera so that she could document her life in prison. Then she noticed the stamps the prison staff had put on my arm. She told me that they indicated I was a visitor and the person I was coming to see was a drug-smuggler. For a couple of young women who have been detained in a Peruvian prison for months now, the girls look surprisingly well. The first thing I noticed is that they are a lot prettier than you would imagine from seeing them on the television. Their hair is nice and their teeth sparkle — they said they have received gifts of toothbrushes and letters from Ireland and beyond. The first months passed very quickly as they dealt with lawyers and prosecutors and police and judges. Now they reckon life will slow down a bit and the reality of their situation for the foreseeable future will dawn on them. They get woken at 6am, while lights are out at 10pm. “There is Spanish TV, but no other luxuries. We have some cockroaches, not too many though. Someone left us a Chinese meal in the kiosk and the box was covered in cockroaches, but we ate it nonetheless,” says Melissa. “A far cry from Ibiza,” I say. “Yeah I was having the time of my life,” Michaella says. Now they have a lengthy sentence to serve as well as a fine of $3,500 for the 11kg of cocaine they tried to bring through Lima airport on August 6 last. “At first we thought we’d get 15 years, so the possibility of six is not so bad,” Michaella says. When I met the girls they thought they might get benefits — a concession that would see them serving only two years. That did not happen. Now they must wait and see where they will serve their sentence. Wherever it is, the girls know it will not be easy and it will take all their resources to persevere. “We have each other, which helps but we do cry a lot too. It’s not easy not having our parents and family around. Sometimes you just need a hug from your mum,” Melissa says. Before I visited the Peru Two recently, I had been to see one of the two major women’s prisons, and made inquiries about the other. One of these will undoubtedly be their new ‘home’ for the foreseeable future. The prison I visited is called Santa Monica. There I met Bronwyn Atherton, 28, a third-generation Irish-Australian prisoner. Bronwyn looks like someone I would meet for coffee in town with her make-up done to perfection, wearing funky tights and a short skirt. “Getting caught is totally surreal,” she says. She was caught with 18kg of cocaine at Lima Airport in 2008, while trying to board a flight to Paris. “I only saw the bag when I got to the airport. Every voice in my head was telling me that this was the worst decision ever and I was going to get caught, but I did it anyway,” she says. Besides cocaine, Bronwyn says the bag contained jumpers, cushions, blankets and all the things you need to go to jail. “The way it works is that the gangs pay off security people at the airports. They are on low wages so it can be anything up to €1,000 or more. “They also get a bonus for catching people. In my case I had 18kg in my bag, but I was only done for 17kg as they kept one for themselves. Often they return the lot back to the cartels. “Rats get shot,” says Bronwyn, who refused to rat out her Colombian ‘uncle’ and his henchmen who were involved with her attempt to smuggle the cocaine. “So are you innocent?” I ask? “Oh no, I’m guilty,” she says, “I was going to get €15,000, which for me was a lot.” But then she tells me her heartbreaking back story. Having been sexually abused as a child, she became a young mother at the age of 19. Three years later, her son died and Bronwyn says she went on a path of destruction. Just then a women comes up to sell us chewing gum. She gives me a toothless grin. “She murdered her husband. That’s not the worst; there’s one woman here who murdered her three children and made soup out of them and fed it to her husband. Santa Monica is much bigger than Virgin de Fatima and has a nice courtyard with trees and shrubs. “I’d go insane without the trees,” Bronwyn says. The food, surprisingly, is not bad and from my visits, the chicken and rice dishes can be highly recommended, while the desserts are as good as you’d get at any half- decent Irish hotel carvery, but they don’t come cheap by Peruvian standards. If you can’t pay, you eat what is provided by the system. Which is not good. “I got food poisoning this week from the free prison food and when I ran into the toilets I nearly got sick on top of a new inmate. She raped another woman along with her boyfriend. I managed to turn a corner and missed her in the end, by just getting sick in the plain old toilet,” Bronwyn says. But she says there is a woodwork class to keep her occupied. She painted a beautiful carved wooden box for me, which I have on my fireplace. She also showed me her beautiful paintings, which will be sent to Australia, and exhibited to raise money for her. This place seems pleasant enough for a prison, but everything here costs money, toilet paper, food, everything has to be bought and it’s not cheap. Lunch costs up to €4. We even pay for the time we spend at the table in the courtyard. The only other European mule at Santa Monica, who was caught with 46kg of cocaine, is a Dutch woman called Francesca. She is serving her 11th year of a 15-year sentence. In her mid-forties, she seems happy enough with her lot. “I was told I would be bringing two litres of liquid cocaine in my bag,”she laughs. “Santa Monica is the best prison in South America. I don’t understand why the girls aren’t here,” she says while lazily gazing around with a few missing teeth as though she were poolside in Vegas. But Carla, a girl who sells clothes on visitor days, is less sanguine. “No, you don’t want to be in prison here,” she says. “People can get sick easily, there are a lot of women here and some of them are drug addicts, though it’s not the same as men’s prisons, where they run the place and there is more violence. “Most of the foreigners are being shipped out of Santa Monica so chances are they will be going to Ancon 2,” Bronwyn says. Ancon 2 is a prison, purpose-built along modern US lines. It’s three hours outside Lima. “It’s a ‘supermax’, so it is a lot stricter,” Bronwyn informs me. “If you wanted to see the girls there, you would have to meet them separately. Santa Monica wasn’t built as a prison; it’s an old convent, while Ancon is like the American-style prisons. On the plus side there are more foreigners there and people do get to study and have more courses available to them,” she adds. That seems to be the best the Peru Two have to look forward to over the next four or five years. “There is an opportunity for a deal to go home earlier,” Loretta von der Horst, a Peruvian journalist who has taken an interest in the case, tells me. I don’t think it’s fair that these two girls (and others like them) should be stuck in jail while the real criminals are roaming free and preparing to set up their next run and dupe the next unsuspecting mules into a long stay in peru. Thanks a million. Yeah I agree- having met them and spoken to numerous experts on the issue of drugs mules. I will attach the full article I wrote here in the coming weeks. It will give more detail into how the cartels coerce people into smuggling drugs. If in theory the girls did give up all information on the criminals who put them up to this would they get to go free cos I remember reading an article saying if they did then they would be home for Christmas, was this just the authorities leading them on or are they too scared to give up information?? Oh and will you be visiting them again soon and did you get the e mail I sent you?? No, I didn’t get the email. Yeah ratting on the bad guys is a bad idea- they could get shot that way. No one ever really rats on them! Send me the mail again. Not sure when I’m going back to South America but I will write about it for sure. Thanks for the comments! Ok I tried sending it again through the contact section of your blog but if that doesn’t work can you see my e mail addy from making posts on this blog and you could contact me through that if my message never got through? ?